My son loves watching movies and TV shows. Most kids do; don't they? I have started using that to my advantage in our homeschool. There are so many wonderful movies and shows out there that I decided it was silly not to use them. I encourage his love of movies and plan to set him up with a film study next year as part of his middle school homeschooling lessons. We have used movies to teach science, geography, history and even to get him interested in reading! Even if movies are fictional there are great jumping off points for discussions on real life topics from everything covering moral character and development to traditional school studies. We've even spent some time comparing special effects and how they have changed through the years. 1. Hunger Games Series-- Watching the movies motivated Ian to read through the whole series of books; something I thought was above his level. 2. Divergent Movie-- After watching and reading the Hunger Games we stumbled upon this movie and he was interested in reading through the book that went along with it. 3. National Treasure 1 & 2-- A fun set of movies to learn more about American history! 4. Apollo 13-- Wonderful movie about the Apollo 13 space shuttle launch. 5. Gulliver's Travels - Based on the classic tale of Gulliver's Travels this cute movie bring them to life. 6. The Day After Tomorrow-- A movie about the coming of the next ice age; a great jumping off point for learning about polar ice caps, global warming, and the natural cycles of the Earth. 7. Martian-- We loved this movie where one astronaut gets trapped on Mars and must use his ingenuity to survive. 8. White House Down-- We love this high action movie about a terrorist group taking over the White house. A great way to talk through the various chain of command and the three branches of government. 9. San Andrea's-- We had a great discussion about fault lines, tectonic plates, and earthquakes after watching this movie together. 10. Cool Runnings-- Learning about the Jamaican Bobsled team and the adversity they faced. 11. Remember the Titans-- Teaching about segregation and prejudice. 12. Miracle-- The story of the American hockey team's Olympic victory against the Soviet Union. 1. Mythbusters-- this has been one of our favorite science shows for awhile now. They do a wonder job of showing the scientific process as well as testing out theories and explaining why they are or are not viable. 2. Ax Men- Ian loves watching shows about men who work. He's fascinated by the different jobs that are available to him out there and how people make their money so this show all about the logging industry really holds his interest season after season. 3. Gold Rush- Ian has often expressed a desire to mine for gold and run his own equipment. This show helps him to see that it's not as easy as it sounds! 4. Yukon Men-- Ian also enjoys watching shows about living off the land and homesteading. He has learned a lot about life in Alaska. 5. Dirty Jobs-- Watching Mike Rowe try out some of the dirtiest jobs on the planet; it's amazing to see the variety of jobs that are available out there. 6. How it's Made- Just like it sounds; this show is all about how things are made. We've watched how they make everything from bubble gum to guitars to skateboard wheels. It's a really neat show. 7. Modern Marvels- A wonderful history show that shows how we have advanced and built some of the most modern marvels. One of Ian's favorites was the building of the Golden Gate Bridge. 8. Forged In Fire- all three of my boys love this show about making knives and swords using both new and old blacksmith techniques. 9. Fast and Loud- watching the people in the garage make over cars and motorcycles using a variety of tools and ideas. 10. Highway Thru Hell- My husband and I enjoy watching this show right along with Ian. Set in Canada, we watch work crews recover some amazing wrecks on treacherous winter roads. They use some pretty neat specialized equipment to get the jobs done. 11. Swamp People-- following people who earn a living hunting crocodiles in the swamps of the south in order to keep populations under control. 12. Deadliest Job Interview-- Some of the highest paying jobs in the world require the most risk; this show follows bush pilots, tree climbers, cave spelunkers, deep sea divers, and more as they apply for some of the world's toughest jobs. 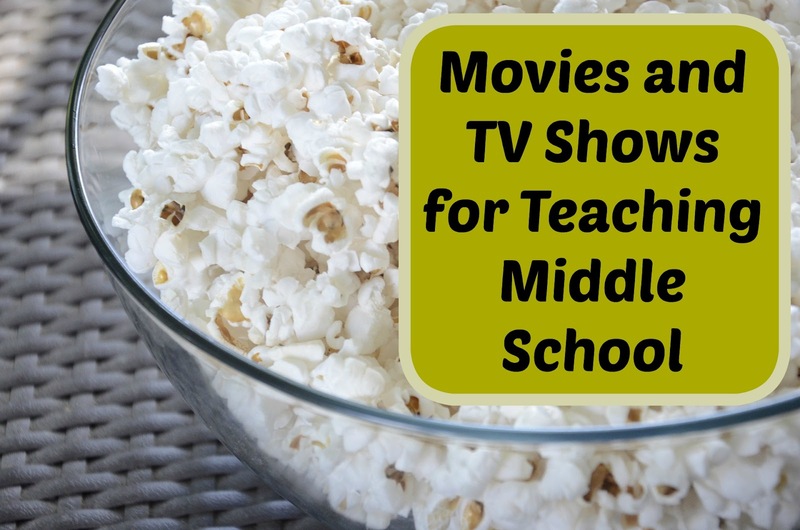 What are some of your favorite movies and TV shows for teaching middle school? We absolutely love the National Treasure movies. I have not seen The Day After Tomorrow, but it looks interesting! A lot of those are favorites around here! Did you list Night at the Museum? There's a lot of history in those movies that can be explored through books and documentaries (like Easter Island Heads, Egyptian pharaohs, Napoleon, etc.). And they're funny. LOL I used to use Netflix for a while (until we stopped). The series on the National Parks was awesome! Yeah we love Night at the Museum. I thought about putting that one on here but my middle son didn't seem to think they were as appropriate for "big" kids. I love the amazing race but I'm not sure if any of my boys have watched it. Thanks for the link and the resources! We'll have to check them out. We've loved watching many of these movies. My kids love Myth Busters, too :) Great lists!